Make space to exercise at home by transforming your extra square footage into a workout zone. No worries if you don't have a bonus room. Even a nook or empty corner just big enough for your kind of training could become a spot to work up a sweat. These ideas for fitting a gym into your home by Mr. Kate will get you inspired. This idea by Eisner Design turns a dark basement into a sun-drenched space that both kids and parents can enjoy. The homeowners needed a place where they could get their cardio fix while watching their kids. On the left is the home gym and on the right is the children's playroom. Take all that junk out of your attic and turn it into a home gym. Interior designers at Geometra Design converted an unfinished attic into an open and airy fitness room. Architectural details give the gym in this newly built house by Cedar Hill Custom Homes plenty of old-timey character. The brick walls and exposed beams epitomize industrial style. Vibration mats placed under the exercise equipment keep the wood floor protected. A bump out created extra space for a gym in this Southern California home remodeled by Tim Barber LTD. Handsome millwork, vintage lighting, cork flooring, and sliding barn doors give the room that homey farmhouse look we all adore. Corey at Sawdust 2 Stitches turned a boring bonus room into a home gym that inspires her to run. To make her space workout worthy, she spruced up the walls with painted ombre stripes. Covering the beige carpet with interlocking rubber tiles was next. For storage, she added inexpensive gym lockers. Topping things off is a bench and custom wall art. Got a spacious backyard? Installing an accessory dwelling will give you the extra room for your conditioning equipment. For instance, this compact structure by EcoSpace Studios packs all the amenities found at top notched facilities. A spare bedroom becomes a yoga retreat in this home by Reena Sotropa Design Group. A large mirror helps yogis check their alignment and form. The sizable woven rug soothes bare feet. So the homeowner can get gear organized, there is plenty of wall storage and a rolling cart for yoga essentials. Our favorite feature is the wallpapered ceiling, which enhances the room's peaceful vibe. While a home gym with a beautiful view is ideal, you can turn a windowless space in your home into a fresh and airy workout zone with these ideas from One Three Design. Recessed LED lighting, white shiplap walls, and floor to ceiling mirrors keep things feeling bright. Worried about dumbbells scuffing your floor? Interlocking foam mats as shown usually cost $7 or less per tile. Another smart idea to steal that will enhance your workout experience is the towel and water station. There is more to see in this room next. On the opposite end of the room, we just mentioned are two cardio machines. A feather wall decal adds a pop of visual interest. Another smart feature is the barn style sliding door that does not take up floor space when open. We love remodels that pack more fun and function into a home like this basement update by Vonn Studio. The workout zone on the right features amenities typically found at health clubs. After working up a sweat, there is a fully stocked bar on the left for kicking back. When it comes to motivation, having a spot where you can work out in a small apartment can make a huge difference. The first step is carving out the square footage for a home gym. IKEA Ideas suggests creating a nook in your bedroom or living room with a curtain room divider. In this space, a curtain chisels out just enough room for yoga and weightlifting. To keep your workout gear organized, hang some shelves or get a small storage unit as shown. If you kick your car out of your garage, you can turn the space into a gorgeous home gym just like this one by Mr. Kate. The goal here was to create a super functional and fashionable spot for exercising that is chock-full of spa-like accents. Shown here is just a small section of the conversion. To soak it all in, take a peek at the following photo. Here is another spectacular glimpse of the garage to gym conversion by Mr. Kate. White walls, new flooring, and gorgeous french doors brighten the formerly dark space. Besides the workout equipment, the gym also includes a fridge for drinks and chilled eucalyptus towels. The cherry topping off this sweet spot is the crystal chandelier. Finding square footage to store big bulky weights can be a problem in rooms of all sizes. This wall-mounted cabinet tutorial by Ben at Homemade Modern solves the problem. When closed, it is designed to conceal a CrossFit inspired home gym without taking up precious floor space. Menter Byrne Architects turned a detached garage into a CrossFit funhouse. Hanging off strong steel beams are gymnastic rings for strength training. Old school gym mats on the floor provide cushioning. At the back of the room is loft storage. Behind the chalkboard covered barn door is a toilet. The stainless steel, trough sink on the left offers a spot to rinse off. Overhead are four Industrial inspired pendant lights. Our favorite feature? The two hammock style swing chairs. Create a sanctuary for yoga and meditation like this blissful room by Elemental Architecture. A row of mirrors amplifies sunlight. Minimal furnishings and white walls eliminate the visual distractions that come with fussy decorating. For storage (seen in the mirror) there is a simple rolling unit. Think you do not have room for a treadmill in your small apartment? This smart idea by the duo behind Craft Your Happiness shares how to turn a nook in your home into a concealed workout zone. To get the job done, you will need to install a floor to ceiling curtain. Afterward, make your new treadmill nook more inviting with pendant lighting and inspirational wall art. Keeping a cardio machine in your living room is no longer a decorating faux pas. A, for instance, is this sleek spinning bike on display in blogger Bianca Chvatik's home. Following her lead may encourage you to workout more often. Unlike a basement or garage gym, keeping your conditioning equipment in one of the most used spots in your home may make it harder to skip exercising. The entire fourth floor of this Brooklyn townhouse remodeled by BFDO Architects is a guest room outfitted with white oak shelves and a workout zone. The latter features a wall-mounted chin up and dip rack. There is also an anchored resistance band. A thick exercise mat protects the wood parquet floor from dropping barbells. Live in a tiny rental? Installing wall-mounted shelves for a collection of conditioning accessories may put your security deposit at risk. But that should not squash your home gym dream. 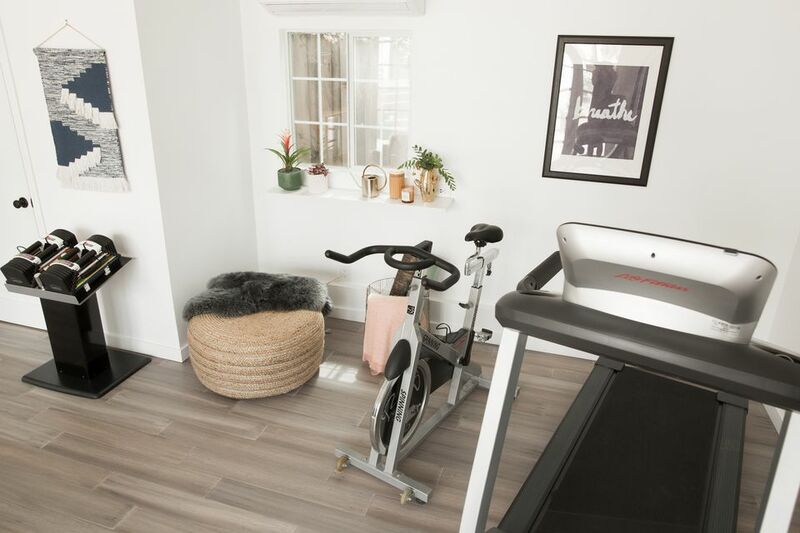 A rolling cart like this one turned a small nook in an abode designed by Kylie M. Interiors into a workout zone. Several appliances can make a home gym more enjoyable. A beverage refrigerator, speaker sound system and a wall mounted flat screen make working out in this space by Lory from Designthusiasm a pleasure. Get your sweat on with a residential climbing wall like this one by Ezra Lee Design and Build. FYI, any area underneath your climbing wall must be padded for safe falling. In this Brooklyn town house remodeled by Built In Studio a wide hallway at the top of the stairs is the ideal spot for a home gym. The recessed lighting and white walls brighten the windowless nook. Here may be the ultimate home gym designed for hard-core cross training. Designed by John Kraemer and Sons the room features concrete walls for anchoring heavy equipment. Covering the floor is commercial rubber flooring. Our favorite touch is the disco ball (hanging from the ceiling) that adds a bit of flashy whimsy. Outdoor cyclists will love this earthy, home gym by Sogno Design Group. The wood walls are aesthetically pleasing. Near the window is a treadmill for warming up. Floating shelves create spots to park bikes. After a long hard ride, there is a hammock for a recovery nap. Want to build a barre studio at home? This studio by Hendel Homes includes two essential ingredients: a wall mounted ballet barre and enough room to move your body. But you do not need a bonus room to create a spot for ballet-inspired workouts. This DIY by Simplified Building shows up to whip up a portable barre for plies and stretching. The builders at Jackson and Leroy turned a dark basement into an open and airy home gym with these décor tricks. Built-in cabinetry and colorful carpet tiles give the space a spa-like vibe. Recessing lightings keeps the room looking bright and cheerful. And when things get heated, two ceiling fans will cool down the gym. Wall workouts are becoming incredibly popular because the activity does not require tons of heavy equipment. Fitness walls like this one designed by Isawall combine tools for strength training like resistance bands, body straps, and pull up bars on a single wall mounted unit.